Let’s get straight to the point. 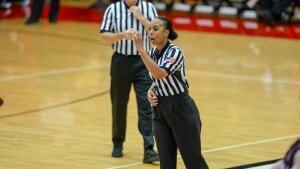 Crystal Hogan — former athlete, mother, parole officer — is also the only female official in the country working men’s Division I basketball games. One of the few to ever do it. But before going any further, a question must be answered. What’s that lady doing, pulled over to the side of the road, crying behind her steering wheel? This would have been during the late summer in southern California. Hogan can even be more exact: “August 15, at 1:02 p.m, I got a call from Mr. Bobby Dibler. I was leaving my mom’s house and driving on the 91 freeway, and I told Bobby I had to pull over. I will never forget that. Bobby Dibler? Coordinator for the Western Officiating Consortium, managing referees for six D-I leagues. He had an offer for Crystal. Wanna come work men’s basketball games? More than three months later, Dibler still remembers the reaction. “I thought she was going to wreck her car. I said, `Crystal, just pull off.’ I know there were some tears coming from her eyes, and quite frankly, my eyes were a little watery. She was a multisport athlete in high school, took her basketball skills to Compton College and Long Beach State, then was introduced to officiating by a friend. Liked it. No, strike that. Loved it. She preferred working the guys’ games for the challenge, but the high schools were hesitant about that sort of thing. “They weren’t very willing to allow me to do boys basketball.” She ended up officiating the Drew League, the famous summer league in California that attracts gobs of talent, including NBA players. Hogan still remembers the day she called a foul and counted a basket. The foulee was Harden. The fouler was Kobe Bryant. “He gave me a look,” she said. Every day, every second in the Drew League prepared her for what was to come. Even getting scowled at by Kobe Bryant. Hogan was good enough, and strong enough and committed enough to work the Drew League for years, even through some zig-zags with her day job as a parole agent. Transferred, laid off, hired back. And a daughter to raise. But through it all, there was officiating, and the goal of one day maybe working men’s college basketball. Then came the past summer. She was invited to a camp in Las Vegas to work a high-level boys AAU tournament with other candidates. Dibler and many other decision-makers in the officiating community were in the stands to evaluate, looking for new referees. Let him take it from there, about the first time he watched her work. Dibler studied Hogan’s presence and demeanor, on and off the court, liking what he saw. He wasn’t alone. And so, at 1:02 p.m. on August 15, he picked up his phone to call Crystal Hogan. Big deal to her. Big deal overall? A smattering of women have worked men’s games before, but she would be getting the full exposure, in a half dozen leagues all around the West. “On that platform, it’s probably a bigger deal than I’m giving it credit for,” he said. Emotional win for Dupree McBrayer and @GopherMBB. Things seem to have gone well. “She’s had opportunities in all six leagues, and there have been no negative comments come back,” Dibler said. Hogan report her fellow officials have been great, and reception from the stands respectful. Well, as respectful as referees are going to get. “I heard one comment I knew I was going to hear sooner or later. This isn’t women’s basketball. Hogan was on her way to the airport to work a game at Weber State, remembering that other day on the freeway when her phone rang, and what it meant. “I’ve come to the conclusion that failures lead to success. Through my journey, there’s been ups and downs. It just shows that if you continue to be persistent, if you continue to work hard and stay positive and just keep going, good things happen. And this happened. She has one fervent wish — that kids are watching, learning something about the power of dreaming. One other goal for Crystal Hogan: There’s a thing called March Madness. She yearns for the day she walks into an NCAA Tournament site, with a game to work.